Monday June 19th 1893 Will helped me get the washing nearly done before breakfast. I then did scrubbing and cleaned up things after breakfast that took most of the forenoon. Mrs Rich called I sewed in the afternoon while Fanny was gone over the river. She was over most of the day with Eva Parvin. Josie came in to work for Hattie. Tuesday June 20th 1893 I ironed before breakfast. Will went to work on the road but hurt his back so he could not do anything. I sewed in the afternoon weather very warm for the two last days. 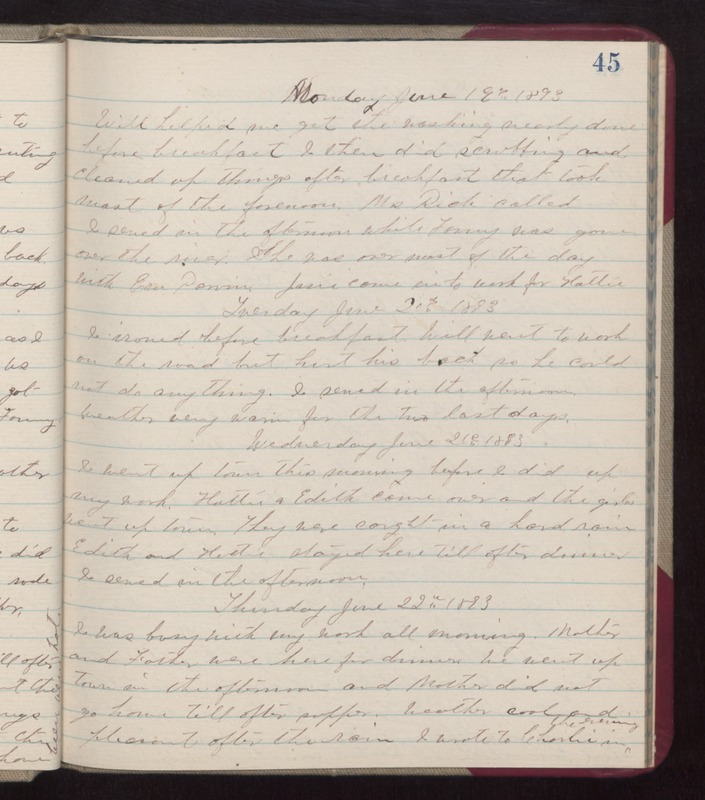 Wednesday June 21st 1893 I went up town this morning before I did up my work. Hattie & Edith came over and the girls went up town. They were caught in a hard rain. Edith and Hatt stayed here till after dinner. I sewed in the afternoon. Thursday June 22nd 1893 I was busy with my work all morning. Mother and Father were here for dinner. We went up town in the afternoon and Mother did not go home till after supper. weather cool ad pleasant after the rain. I wrote to Charlie in the evening.